Become a Certified Executive Coach. By taking this course, you will have completed 8 hours toward the 52 training hours required for certification as a Certified Executive Coach (CEC). Click here for more certification information. By completing this course, you will also have earned 8 elective hours toward the Certified MentorCoach certification and ultimately toward certification with the International Coach Federation. Experienced coaches…Experienced executive coaches..Students who are entirely new to the field…Students with little experience or confidence in their ability to do executive coaching (Learning to do assessments can be a great confidence-building step. )…Coaches who intend to apply the assessments in other areas of coaching. The Executive Coaching Assessments MasterClass will give you an in-depth look at how you can use assessments to create coaching interventions which will deliver measurable results. Assessments are an essential tool for executive coaching and extremely useful in other coaching niches. When choosing executive coaches, organizations often ask the candidate, “What 360 instrument do you use?” “What assessments do you use?” You need to have an answer for these questions–even if you ultimately end up not using assessments with the client. The assessments covered will include two 360 feedback tools and an assessment that identifies conflict among teams. One assessment focuses on identifying and leveraging thinking styles. The second assessment helps with team management. And the third assessment tool combines the VIA with Gallup research for a unique approach to strengths in the workplace. The assessments are a valuable way to identify organizational culture. They share other cutting edge resources and tools that businesses currently use. The process also allows the coach and client to bond. More to the point, they are an essential tool for anyone who would do executive coaching. Essential for practice. Essential for your marketing. Students will receive copies of all instruments with detailed instructions on how and when to utilize them. Graduates of this class will be able to earn eight hours of CEs for social workers (NASW) and Marriage and Family Therapists in California (BBS). The CE administration fee is $75. CEs for psychologists (APA) are not provided for this class. To receive credit for CEs, students must pay the CE fee and be present for 7 classes. Listening to the class by recording does not count toward the attendance requirement for receiving CEs. Note: The CE fee applies only if you are a licensed mental health professional in the US and need CEs from one of the organizations listed above (NASW, BBS, etc.) Otherwise, when you register, indicate that you do not need to pay the CE fee when you register. CE FEE: When you register for the class, if you want CEs, click on the drop down menu next to “Add CE’s”. Pick the kind of CE’s you need and click on it. There will be a $75 administrative fee for your CEs. MentorCoach is an International Coach Federation (ICF) Accredited Coach Training Program. 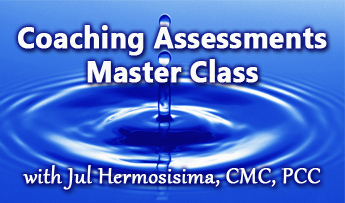 This class Provides ICF Continuing Coach Education (8 ICF CCES- 8 hrs Core Competencies). There is no charge for ICF CCEs. To receive credit for ICF CCEs, students must be present for seven of the eight classes. Listening to the class by recording does not count toward the attendance requirement for receiving ICF CCEs. Refund Policy: You may withdraw your registration at any time before the beginning of the second one hour class and receive a full refund. You are responsible for the full tuition amount if you do not withdraw before the beginning of the second class. Jul Hermosisima designed and has been lead trainer in this course for the last four years to rave reviews. She is a MentorCoach International Trainer and has partnered with Anne Durand in co-teaching the Executive Coaching MasterClass since 2008. Jul holds degrees in business administration, international business, and public administration. She has 30+ years of experience working at the world renowned Toyota University, specializing in training and development. She has created and implemented a wide variety of educational and training programs for executives at all levels of Toyota Motor Sales around the world. She was the first person in Toyota to use 360 degree assessments and has two decades of expertise in the use of a wide range of assessments in executive coaching. She served as an Advisory Council Member of a key Toyota business partnering group: TODOS -Toyota Organization for the Development of LatinOS. Jul lives in Southern California with her husband of 25+ years and is blessed with three children (14, 24, 26). She is active in several non-profit organizations in her community including the Girls Clubs of East Los Angeles, Safety for Life, Su Casa, and Careers for High School Students. Jul’s email address is julmaree@gmail.com. Her website is www.jultones.com.